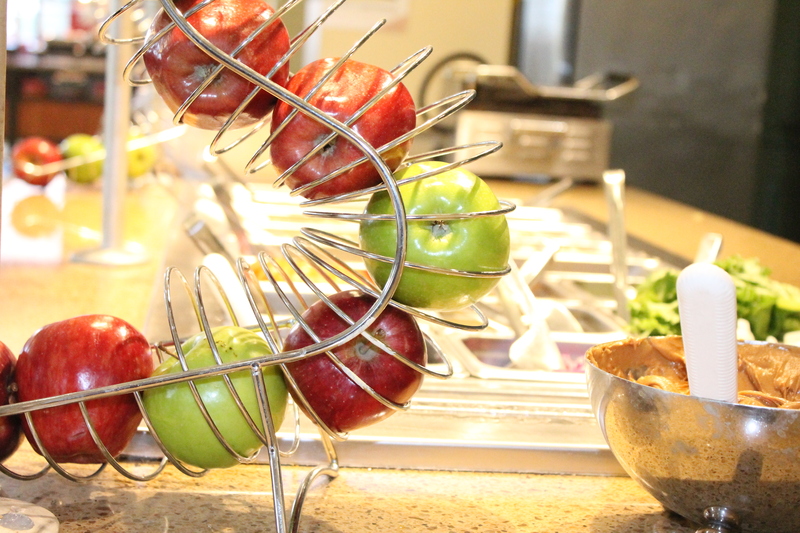 Corrin Refectory, better known as “the rat,” recently implemented several changes. This changes come after the Refectory received a 85.5 sanitation score from the Health Department in Jan. of this 2015. Tera Perez became the new head of Dining Services in March following a second inspection by the Health Department. Perez has been working for Aramark since 2004 and has held positions at several different locations including East Carolina University and University of North Carolina Chapel Hill. Since becoming head, Perez has made various changes to the Refectory, resulting in the facility earning a sanitation score of 96 during their most recent inspection on Oct. 13. Despite the higher sanitation score, some students still are having issues with the Refectory’s practices. “I find it so disgusting and unsanitary I go out of my way to not eat there,” junior Elena Erez said when asked what she thought of the Refectory. She went on to say she that she had heard stories of raw chicken and moldy food in the Refectory. However, she herself had only seen mold on bread in the sandwich station once. Despite concerns and rumors regarding raw chicken, there has been no proven instance of there being undercooked meat that has been announced to the student body. As well, there have not been any reported cases of food poisoning this year according to Director of Health Services Laina Smith and Dean of Students Krispin Barr. Though there have been no reported cases of any kind of food poisoning, students are still noticing mold and other issues with food in the Refectory. “I’ve found that the grapes are almost always rotten. Same with the strawberries,” said junior Bethany Collins. There have been several incidents of moldy fruit in both the Student Center Cafe and the Refectory. In the latter half of September mold was found on the raspberries in the fruit water container in the Cafe. Senior Emily “Gil” Gilmore posted a photograph of it to her Instagram with the caption, “The raspberries in the water were moldy in the Student center #gross#salemdining #studentcenter #mold#hearmearamark #feedmeSalem” which caused Dining Services to reach out to Gilmore and invite her to send her concerns to them via email. Not all students have had experiences with mold or rotten fruit in the Refectory though. “The only moldy thing I’ve noticed is the lettuce. It is wilted or brown half of the time,” said first year Victoria Steelman. The Health Department found no issues with mold in their most recent inspection of the Refectory. The Cafe, though, has not had an inspection from The Health Department since the summer of 2014. On its last inspection it received a score of 97; however, no follow-up has since been conducted. A majority of the Refectory’s violations found by the department dealt with structural issues such as floor, walls and ceiling cleanability, such as the wall behind the dish machine showing soil accumulation. There were some issues found with the temperature of some of the items on the salad bar, however. Potentially hazardous food items are required to be held at 45 degrees Fahrenheit or below. The grilled chicken, garbanzo salad, and tofu were all several degrees above this. The garbanzo salad was between 48 and 52 degrees, the grilled chicken was at 47, and the tofu was between 45 and 51. After these temperatures were taken, the food was removed from the salad bar and put in the freezer. Despite the issues experienced by some, Steelman enjoys eating in the Refectory. “I love the Rat. I’ve visited several colleges, and the Rat is one of the nicest cafeterias I’ve ate at,” Steelman said. Steelman went on to say that the other cafeterias she had visited were often dirty and lacked the options the Refectory offers. She also noted that the staff is more available to talk with at Salem than at other schools. “The chef and staff will talk to you personally about your food allergies and dietary restrictions,” said Steelman. Gilmore advocates reaching out to the staff as well. “If you see a problem, report it,” said Gilmore. She went on to explain that the only way the Refectory can improve is if students point out the issues. She recommends using the iPad located at the front of the building to report any issues seen during a meal. Comments made via the iPad go directly to Perez’s phone. As a result of reaching out to Dining Services, Gilmore was invited to the Sept. Dining Board meeting. For more information on the Dining Board and the Oct. Dining Board meeting, read the follow-up article in the next edition of the Salemite. Just as the students are working on communicating with the Dining Board, so is administration.